Home / Life at the Manor / All my crip gear has sparkles. All my crip gear has sparkles. Granted, I don’t have a lot of crip gear. But it does, in fact, have sparkles. 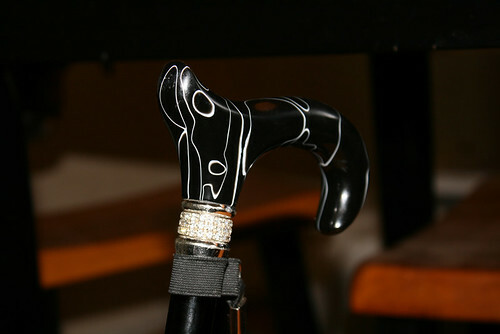 This, friends, is a black powder-coated aluminum adjustible cane with a plastic derby handle, also black, but with white faux-marbling on it. Immediately below the handle, you will observe that the cane’s handle features a triple row of rhinestones. Because if you’ve got to carry a cane, well, rhinestones make everything better. Observe, gentle readers, that this little round pill case has multiple sparkle features. 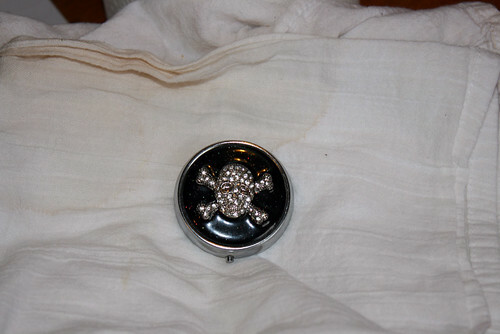 The black background on the top has sparkles, and the skull and crossbones, which is in relief in the center, is filled with rhinestones. See above re: the capacity of rhinestones to improve anything. 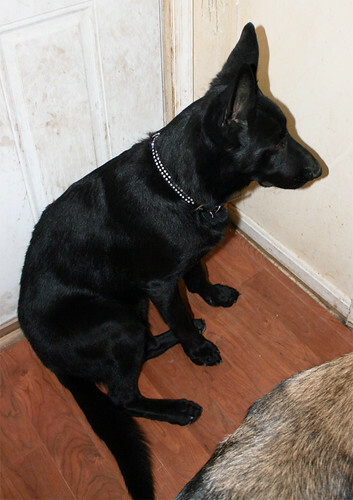 Observe that no only does Sid’s black coat shine (and it’s looking quite nice now that he’s done shedding out his undercoat), but that I have purchased for him a black leather collar with a double row of rhinestones on it. In point of fact, this collar is actually slightly too large for him, so he has room to grow into it and wear it for years to come while service dogging. I am currently exploring methods of adding rhinestones to his mobility harness when he’s old enough to have a permanent one. No one can possibly challenge my right to bring a service dog into a public business if there’s rhinestone fabulosity involved, I am sure of it. I am in total agreement with respect to the concept of rhinestone fabulosity! I happen to have a “Bedazzler” circa early 1980 something. If there are dazzles requiring “Be”ing, I volunteer to affix rhinestones of choice to Sid’s training harness. I am great cane envy at the moment. I like yours a lot better than mine. We have to talk about this soon. At the moment the cane is hanging, the walker is out, but the wheel chair is a must, even in the house. Now, we have to jazz up this wheel chair soon! I love your attitude. You make everything better.